Tips & News to make you a smarter consumer. Posted by Tiffany Sanders, J.D. Cars often present a Catch-22 for people struggling with debt. Maybe your current car payment is too high to manage, but you depend on your vehicle to get to work. Or, maybe your vehicle is on its last legs, and you fear that you won’t be able to replace your car after bankruptcy. You’ve probably heard the general rule that most people can finance vehicles after bankruptcy if they manage their finances responsibly. Now, Lending Tree is providing concrete data. The online lending network reviewed data from more than one million of its users, comparing the loan terms offered to those with and without bankruptcies. What they found may surprise you. On average, people who have filed for bankruptcy within the past five years pay more for automobile financing. However, after the first year, the increased expense drops off dramatically. 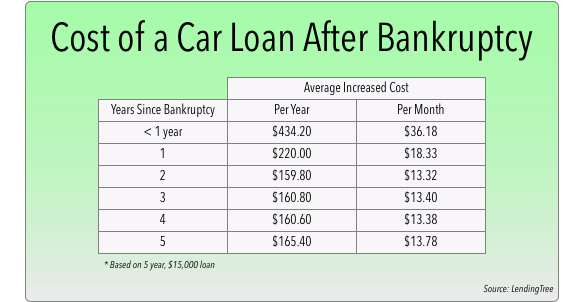 The table below shows the average increase in cost for a past bankruptcy filer who finances a $15,000 car with a five-year loan. Financing a car in the first year post-bankruptcy can be comparatively expensive–more than $2,000 more expensive across the life of a five-year loan. But, even during that highest-cost period, post-bankruptcy borrowers pay an average of just $36.18 extra per month. Two years after bankruptcy, the difference is just $159.80 per year, or $13.32 per month. These rates are in line with those offered to applicants with similar scores who had never filed bankruptcy. In short, those who manage their credit responsibly post-bankruptcy can expect access to automobile financing. In fact, the premium may be less than you expect. For most applicants with stable income, an additional $13-14/month will not be a significant barrier to obtaining a car after bankruptcy. We are committed to your privacy. By submitting, you agree the phone number you provided may be used to contact you by the law firm and its affiliates (including autodialed, pre-recorded calls or text messages). If you want us to contact you without consent, call or click here. Is Student Loan Debt Delaying Millennial Marriage?